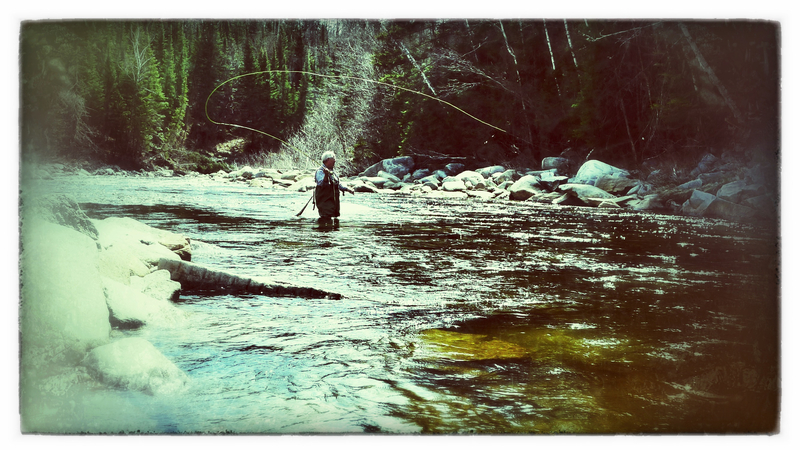 My father fishing the Ammonoosuc River. My name is Stephanie Gould. I am a photographer, angler, and mental health counselor living in the north country of New Hampshire. Last year, after coming to terms with the reality that the patriarch-funded fishing excursions to Alaska and other guide supported outings would certainly come to a close, I made a committment to amass a comprehensive knowledge base of fly fishing that could done locally. This “committment” not only included building a geographical knowledge base, but the more elusive knowledge of the ecology, temperament, and sweet spots of the local waters; a data bank that is only accumulated by trouble-shooting. If one is not a fisherman, she may view this repetitive process of going out again and again with lack luster result as a real time waster; a void; an exercise in frustration. But if you are a fisherman, you are so for your ability to fill such a fishless void with things that are more permanent than the fish you seek to catch and release back to his quarters- a conversation with a grandson, a chorus shouted and sung with your daughter, or a warm, breezy silence in the presence of a loyal friend. See, if you are a fisherman, you can’t help but stumble upon these things in between the reeling… and that’s precisely why when one starts asking questions about fishing, there are stories that tell themselves. I have established this site to document the beauty of the experience of being in Northern New Hampshire, the history and trends of fly fishing in this area, and to promote the lifestyle of fly fishing to those around me, both for its sport as well as the opportunities it creates to build meaningful relationships within family and community. I sincerely thank you for your interest. Reading such incredible words make me feel like I am in the river with you. Now I understand the beauty of fishing…..
You have a habit of saying the kindest things. I sure do love having you and Margaret in my life Johnny B…no matter the miles between us. Great photos and comments! Your dad told me that you are “hooked” on this wonderful sport. Thanks for sharing it.